Nate Solder | NFL News, as it happens, when it happens. Your one stop shop. The Patriots have lost some key contributors from their 2017 team in the early stages of the NFL offseason so far in players such as Nate Solder, Dion Lewis, Malcolm Butler and Danny Amendola; and could still lose several other contributors as the offseason goes on. This seven round mock draft was conducted on FanSpeak.com using their mock draft simulator. Some players may be ranked higher in some rankings and projections then were taken in this mock draft. Following the departure of left tackle Nate Solder tackle immediately becomes one of the biggest needs for the Patriots, as they could still also lose both LaAdrian Waddle and Cameron Fleming to free agency. 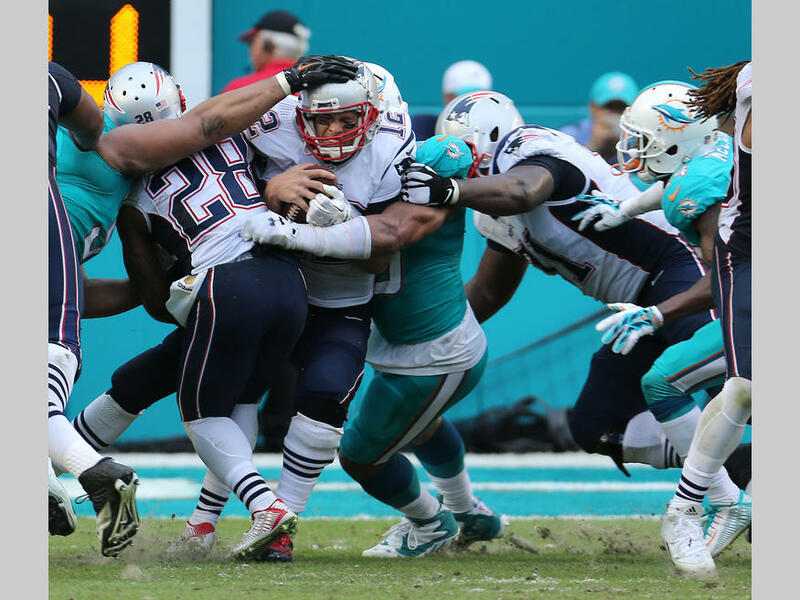 Miller can step in right away and protect the blindside of quarterback Tom Brady. Miller has good size and arm length similar to Solder which will help him defend speed rushers off the edge. The Patriots added tackle Matt Tobin in free agency who as part of an abysmal Seattle Seahawks offensive line last season, and drafted Tony Garcia last year in the third round who missed his whole rookie season due to blood clots. Garcia’s status and health is currently unknown and Miller can step in and start right away. The Patriots linebacking core was terrible in 2017. The Patriots will benefit heavily from getting Dont’a Hightower back from injury in 2018, but is someone the Patriots can not rely on to stay healthy. Vander Esch has very good size at 6’4 250lbs which will allow him to play both inside and outside in the NFL, but projects best as in inside linebacker in the NFL. Vander Esch can be a great compliment to Hightower and also gives the Patriots insurance at linebacker if Hightower misses time again in the future and is a big improvement over guys like Elandon Roberts, Marquis Flowers and Kyle Van Noy. While I believe that Rob Gronkowski will return to the Patriots for 2018 his status is currently unknown. Even if Andrews returns he is an improvement from Jacob Hollister and Dwayne Allen, who still could be released from the Patriots and save the team $5 million in cap space, as well as be a nice compliment to Gronkowski in the passing game, Andrews has great size and was a big red zone threat during his time at Oklahoma. Andrews weakness is that he isn’t a great blocker and is primarily just a pass catcher on offense. Because of this the Patriots could look to keep Allen even if they draft Andrews, who is a great blocking tight end but was practically invisible in the passing game last season. Carter has great size at 6’6 250lbs for an edge rusher and had a very good showing at the NFL Combine running a 4.50 40 yard dash. Edge Rusher is a need for the Patriots but I don’t put it at the top of lists for things they need. Trey Flowers had a good season last year and rookie Deatrich Wise showed signs of promise. The Patriots will also get back Derek Rivers who missed his entire rookie season last year after tearing his ACL in training camp, and I expect the team to bring back James Harrison on a veterans minimum deal. The team has also signed defensive end Adrian Clayborne to a two-year deal. Carter will have time to learn and fill out his frame more as well as be able to contribute as a pass rusher on third downs for the Patriots and give the team another nice piece to have for the future. Cornerback looked to be a big need for the Patriots after Malcolm Butler signed with the Tennessee Titans and the Patriots missed out on top guys on the market such as Aqib Talib and Richard Sherman. The Patriots then made a call to their farm system the Cleveland Browns to acquire Jason McCourty before the team released him. McFadden has good size at 6’2 and has very good ball skills. McFadden could use more time to develop and cornerback isn’t a big need for the Patriots right now with Stephon Gilmore, Jason McCourty, Eric Rowe, Jonathan Jones and Cyrus Jones on the roster but could look to add another corner in the draft. Samuels seems like a player that the Patriots would value and love. During his time at N.C. State Samuels spent time at running back, fullback, wide receiver and tight end. His versatility on offense is something that Bill Belichick would fall in love with. These rankings had him listed as a running back, but other rankings have him listed as a tight end so it’s tough to project what position he will play in the NFL, if he’d even have a true defined position. With the losses of Amendola and Lewis someone like Samuels could have value and step into numerous roles in the Patriots offense, or spend time on the practice squad and work on developing a defined position rather than being a Swiss army knife on offense. It wouldn’t surprise me in the slightest if the Patriots didn’t address the Quarterback position at all in this years draft. It also wouldn’t surprise me at all if they took someone they liked earlier on in the draft. Right now you have to think that Tom Brady has at least three more years left and Brian Hoyer is a more than capable backup QB. The Patriots met with Litton at the NFL Combine and seems to be someone they could have some interest in if they do want to address the quarterback position in the draft, but as of right now they have other holes and needs to fill. The New England Patriots have had a long run of exceptional success. The Bill Belichick-Tom Brady link has a lot to do with the dominance they have over the rest of the NFL. This year, despite losing Brady for the 1st four games (no comment necessary), they have what could be the deepest, if not most skilled, roster in years. Despite missing some key players early due to injury, fans will be rockin’ as the 2016 Patriots evolve. Are there still areas of concern? Definitely… but all positions are filled with strong, talented young players chomping at the bit to replace seasoned vets. Think about it. The lack of training camp transactions and difficulty in selecting who will be among New England’s 53 man roster opening day this deep into camp is a strong indication that the back-end will have skills needed to survive the long season. After two pre-season games, the competition for playing time is fierce. And, let’s face it, that’s good for everyone. Shoot, even Tom Brady, arguable the best QB in NFL history, can’t find playing time when he wants to. OK, I know, he was playing with scissors and cut himself, keeping him out of game #2, which he was scheduled to start. But the point is, someone has stepped in and done the job. You may not be a fan of Jimmy Garoppolo as the “long-term” answer when TB retires, but he has shown the ability to hold things together while Brady is out. Let’s take a quick look at what we could see on offense opening night, September 11, in Arizona. QB: (2) This one’s a no brainer,( so I qualify), and my prediction -ta dah- unequivocally: the two slots are owned by Goroppolo and rookie Jacoby Brissett. How’s that for stepping out on a limb. It is doubtful the Patriots will sign a veteran back-up QB for the 1st four games unless one of those two get injured. Brady does not take up a roster spot until game 5. Veterans include Danny Amendola, Jules Edelman, Nate Washington, Chris Hogan, Keshawn Martin, Aaron (yep, he’s still here) Dobson and old faithful Matthew Slater. Young and looking to step in players are Chris Harper, Malcolm Mitchell, DeAndre Carter and Devin Lucien. Injuries will factor in the final six. The availability of Amendola and Mitchell are the two question marks. If healthy they are locks, along with Edelman, Slater, Hogan and Harper. That leaves Washington, Martin, Dobson, Carter & Lucien on the outside looking in. If either Amendola or Mitchell can’t go, look for Martin to fill their slot. TE: (3) Like QB, the first two are easy – Rob Gronkowski & Martellus Bennett. After that is a big question. Do you want a blocking, athletic or flexible player filling that role? Based on his performance to-date, I’m going with AJ Derby (FB James Develin is capable of filling the blocking TE role). As of 8/21 veteran Clay Harbor is listed ahead of Derby on the Patriot’s unofficial depth chart. RB: (5) BULLETIN – CSNNE is reporting Dion Lewis needs more surgery. James White has looked good in that role, but lacks Lewis’ elusiveness. LeGarrette Blount has impressed in pre-season, but is vulnerable with the emergence of Tyler Gaffney. Branden Bolden’s value on special teams will be the determining factor for him, leaving Joey Iosofa and D.J. Foster with little chance. As mentioned under TEs, James Devlin’s flexibility as both a blocking back and TE make him seem a certainty. Final five – Gaffney, White, Devlin, Bolden & Blount. Would not be shocked if either Blount or Bolden were cut. It seems like every year Belichick makes a surprise cut, so either Blount or Bolden could be this year’s shocker. OL: (9) As in all but a few predictions, health is the determining factor. Sebastian Vollmer is out & Tre’ Jackson is hurt. A decision on Jackson needs to come shortly. (A player must open training camp on PUP in order to be eligible to be placed on the reserve/PUP list to open the regular season). His leadership will be missed, but the offensive line is gradually revolving into a young aggressive group, with rookie Joe Thune at left guard and Shaq Mason (broken hand) looking at more playing time. Center Dave Andrews beats out Bryan Stork at center, leaving veterans Nate Solder, Cameron Fleming, LaAdrian Waddle & Josh Kline joined by youngsters Ted Karras & Tre’ Jackson. If Jackson isn’t available (heaven forbid). add Marcus Cannon (ugh) to the list. No sense at all about Jonathon Cooper, who has been suffering with foot problems since the 1st padded practice. Probable IR candidate. Quarterback: Jimmy Garoppolo, Jacoby Brissett. (Brady suspended first 4 games) (2) This ones pretty obvious, Garoppolo will be starting the first four games of the season while Brady is suspended and once Brady’s back he’s taking over. There was talk about the Patriots possibly bringing in a veteran QB with rookie Jacoby Brissett in the backup role but Bill Belichick shot those rumors down this week and the two QBs on the roster will be Garoppolo and Brissett. Running Back: LaGarrette Blount, Brandon Bolden, James Develin, James White, Tyler Gaffney. (5) Let me start off by saying no Dion Lewis is not getting cut. Lewis is currently on the PUP list and has yet to practice after his season-ending torn ACL last season and I think the team leaves him on the PUP to start the season. There has been speculation that Blount could be cut but I don’t think that’ll happen, running back is probably the weakest position on the team right now and I don’t see them cutting the veteran and going into the year with a bunch of backs with not much if any NFL experience. White did a pretty good job after the Lewis injury last season and looked good in the teams first preseason game and can be the pass catching back out of the backfield until Lewis returns. Gaffney is finally healthy and looked pretty good in the first preseason game, breaking off a 44-yard touchdown run. If he can continue to look good in games and practice he could find a spot on the roster. Wide Receiver: Julian Edelman, Danny Amendola, Chris Hogan, Malcolm Mitchell, Aaron Dobson. (5) The first four guys listed are obvious, Edelman and Amendola are your starters, Hogan signed a big contract this offseason and Mitchell was taken in the 4th round this year and has looked like a stud prior to his elbow injury, which thankfully he’ll only miss up to four weeks with and has been practicing with the team already in non-contact drills. Not listing Matthew Slater as a receiver because he never plays on offense and is a special teamer. Aaron Dobson is the luckiest man in the world and will somehow find a way to make the 53-man roster again. Dobson always shines in camp and the preseason but can never get it together in the regular season. Keyshawn Martin is still not practicing with the team due to an injury and though I’m a fan of Martin don’t think he’ll make the final roster if he can’t get healthy. Rookie Devin Lucien and Chris Harper I think will find their way to the practice squad. Tight End: Rob Gronkowski, Martellus Bennett, A.J. Derby. (3) Gronk and Bennett are two of the best in their position in the entire league and are obvious roster locks. The third tight end spot will come down to either A.J. Derby or Bear Pascoe. The two are completely different players, with Derby being a receiving tight end and Pascoe being a blocker. Derby made a few nice plays in the first preseason game against the Saints which could help him earn a spot on the roster. Pascoe could take over the Michael Williams role from last year as pretty much being an extra lineman on the field. It depends which route the team chooses to go but right now I give Derby the slight edge. Offensive Line: Nate Solder, Sebastian Vollmer, Joe Thuney, Josh Kline, Shaq Mason, David Andrews, Ted Karras, LaAdrian Waddle, Marcus Cannon. (9) Jonathan Cooper was a tough cut here but with him being injured and his injury history it could be tough for him to make the team. Joe Thuney has looked like the teams best offensive lineman and like a steal selecting him in the third round of this years draft. Bryan Stork was a tough cut but with his concussion problems and inconsistent play it shouldn’t be a total surprise if he doesn’t make the team. With versatile players such as Kline, Karras and Thuney able to move to center and backup David Andrews, Bryan Stork could be replaceable on the line. I HATE HATE HATE HATE HATE Marcus Cannon but it doesn’t look like the team will be cutting him, even though he couldn’t block my 12-year old cousin. Tackle is really weak with Solder, Vollmer, Waddle and Cannon and the team could look to make a move. From what I’ve seen and heard I really like Ted Karras, he’s a guy who can play a few positions on the line and adds a toughness to the line. I think Tre’ Jackson starts the season on the PUP list to get completely healthy and see what they have Karras, if he struggles they could move him down to the practice squad when Jackson is healthy. Defensive Line: Rob Ninkovich, Jabaal Sheard, Malcolm Brown, Alan Branch, Terrance Knighton, Trey Flowers, Geneo Grissom, Vincent Valentine, Chris Long. (9) The most complete area on the roster. No debates on who makes the team out of this group. Markus Kuhn is someone who Bill Belichick likes but I don’t see him beating out any of these guys for a roster spot. Ninkovich is already practicing after tearing his triceps and is unknown if he’ll be able to play week 1 but he’ll be on the roster. Heard is gonna replace Chandler Jones with the help of Trey Flowers who was electric against the Saints and was all over the place making plays. Brown, Branch, Knighton and Valentine will add some beef to this line that will be hard to run against. Linebacker: Jamie Collins, Donta’ Hightower, Jonathan Freeny, Shea McClellin, Kamu Grugier-Hill. (5) Not too much depth at linebacker but Collins and Hightower are two of the best linebackers in the league and are obviously locks. Jonathan Freeny played well last year and should also be a roster lock. McClellin is a similar player to Ninkovich and can play both linebacker and defensive end, he doesn’t do anything great but can do a few things well. Grugier-Hill is a smaller linebacker and played defensive back in college and played well in pass coverage against the Saints. He could have a big role covering tight ends and backs out of the backfield. I expect to see a lot of two linebacker sets featuring Collins and Hightower if both can stay healthy. Cornerback: Malcolm Butler, Logan Ryan, Cyrus Jones, Jonathan Jones, Cre’Von LeBlanc. (5) A very inexperienced group outside of Butler and Ryan. Cyrus Jones was the teams top draft pick taken in the second round this year and is a lock to make the team and looks like he will be the teams starting slot corner. Jonathan Jones generated a lot of buzz during OTAs and at the beginning of training camp. He got beat a few times against the Saints but also made a few nice plays and pass deflections. Cre’Von LeBlanc has also been generating some buzz in Foxborough after his amazing interception against the Saints. He had good, tight coverage throughout the game and performed well in joint practices this week against the Chicago Bears. Was tough to not include Justin Coleman because of experience over Jones and LeBlanc but he has not had a very good camp up to this point. Got beat a couple times against the Saints in the first preseason game and struggled this week in joint practices with the Bears. This is a young unit with a lot of potential, but also a lot of question marks. Safety: Devin McCourty, Patrick Chung, Duron Harmon, Jordan Richards. (4) A very strong safety unit that could hopefully help out the young corners. McCourty and Chung are two of the best in the league with McCourty providing help to corners over the top and Chung playing down in the box and covering tight ends. Harmon is similar to McCourty providing help and creates a lot of plays in the secondary. Jordan Richards was very limited last year and will be interesting to see how he does this year and the different roles they could use him in. Special Teams: Stephen Gostkowski, Ryan Allen, Joe Cardona, Matthew Slater, Nate Ebner, Brandon King. (6) The best special teams unit in the entire NFL. Gostkowski is by far the best kicker in the league in my opinion, Matthew Slater might be the best special teams player of all-time, Ebner is back from the Olympics and who is another great special teams player, as well as Brandon King. Another big contributor to special teams is Brandon Bolden who I have listed with the running back group. We’ve been waiting for this ever since the Patriots lost to Denver in the Post-Season AFC Championship game last season. And no one was disappointed in the way the 1st pre-season game started with the defense forcing 4 turnovers. Although it was just the first game, there was a lot to look for in deciding just how good this season could be. Questions weren’t fully answered, but there were positive signs…and some areas of concern, based on the victory. Jimmy G: He was OK. Not great…not terrible…not ready to fill Tom Brady’s shoes. Went 11-18 for 168 yards. After a slow start he improved as the game progressed. Critics remain unconvinced, while others see enough to be comfortable that New England will survive the 1st four games without #12. Offensive Line: Oh- Oh, looked a lot like last year. Hopefully we’re not saying this as the real games begin. The 1st quarter in particular was a disaster, but things did get better as the game progressed. Defense: If this was a sample of what’s to come, other teams are in for trouble. Lots of forced turnovers (4), scoring (2 TDs) and aggressive play. Was surprised to see Dont’a Hightower & Jamie Collins play as much as they did, and both looked ready for the real games to start. Martellus Bennett (TE) looked like the beast we expected. He played in the 1st half and showed all the skills we thought he had, both catching the ball and blocking. Played 37 snaps (+), was thrown to 4 times with 3 catches and a key block on a big run by James White. Fans will be happy with not only his pass catching skills, but need to watch how good this big guy is while blocking for others. Can’t wait to see him and Gronkowski paired up, but probably won’t until Game 1 against Arizona. We can dream they’ll be in against the Panthers in pre-season game 3, but don’t count on it. Nate Washington (WR) played, but wasn’t a factor. Doubtful to make the opening roster unless more injuries occur to existing corps of wide receivers. Cyrus Jones (CB) looked like a solid 2nd round pick (1st for the Pats), but need to see more of him to get a feel for his possible impact on this year’s team. Had a fumble recovery. Jacoby Brissett (QB) showed off his arm, but has to learn there are times you need touch and times you can’t force the play. Overall, the young man was fun to watch as he played the entire 2nd half and does show promise. (7-13, 64 yards) Not about to leapfrog Jimmy G yet! Malcolm Mitchell (WR) showed the best hands of any WR on the team before (in a gruesome looking play) he extended his elbow and won’t return for at least 3-4 weeks. Look to see the 4th round draft pick on IR, keeping him out of action for the first 8 weeks (Thanks for info from Jeff Kane). One down, 3 to go. Here’s a little about the watch-ability of pre-season games. Warning: Watching preseason football can be painful. Game 1 vs New Orleans was **, although this year the 2nd half held interest as players that have show some skills played until the end. I believe this is the first time I have watched the entire 1st preseason game with interest. Game 2 vs Chicago (Thursday, 8/18 8PM Home) *** More regulars playing longer period of time. A few of the walking wounded may actually see some playing time, but not much. Game 3 vs Carolina (Friday, 8/26 7:30 Road) **** This is the closest the pre-season comes to a real game. Watch beginning to end with a sense of what the strengths & weaknesses of both teams are. Wondering how much Brady will play? Game 4 vs NYGiants (Thursday, 9/1 7PM Road * Scratch your head while watching this one! You’re ready for the regular season and both teams are holding back and playing Plain Jane football. It’s another year of football, and it should be outstanding in New England. One of the great things about being a fan of the New England Patriots is, when one season ends you always know that next season will be exciting, with another legitimate chance for the Lombardi Trophy. It’s really a thrill to look forward to what will happen next and have confidence that it all will work out fine. Just think about it. How many fans of other teams in the NFL can legitimately make that statement? The answer is – zero! The current Super Bowl Champion Bronco’s? Who is the QB again? The runner-up Carolina Panthers? Hell, their fans are thrilled to just make the play-offs. Although they are the favorites going into the year (the Patriots are #2), they have to show they can perform year in and year out. The Green Bay Packers? Close, but no cigar. Last year the were vulnerable all season and are rapidly deteriorating. cheated out of a Super Bowl by….the Patriots…in the AFC Championship Game (No, not the Super Bowl)! That was 12 years ago, the Steelers lost 41-27 at home, and they are still crying about it. No looking forward there! Seattle? With Pete Carroll making the final call 2 years ago the fans of the Seahawks were deflated (sorry, had to get that in). Carroll vs Belichick = a no brainer! There are plenty of other teams that could be part of the conversation, Arizona, KC to name just a couple, but year-after-year, they haven’t proven good enough to carry the banner. Belichick will be there to start things and Brady will, at some point early in the season, return. With a growing, young defense the team should be just fine and maybe Tom will be better off starting the season a little later (I know that’s heresy), so by the play-offs he won’t be so banged up. The offensive line will be better. Hell, it couldn’t be any worse. With the return of Dante Scarnecchia you know they’ll be better prepared. Rookies Tre’ Jackson and Shaq Mason will be in their second year and know their roll and the speed of the NFL better. Sebastian Vollmer and Nate Solder should be healthy. The addition of former 1st round pick Jonathan Cooper adds depth they lacked in 2015 when injuries destroyed any chance for consistency. The two TE offense is back! Martellus Bennett is not Scott Chandler in any way, so please stop the comparisons. Provided he doesn’t tick off Belichick with his mouth, Bennett and Rob Gronkowski will ease the pressure on Brady (or Jimmy Garoppolo) and the red-zone offense with those two, Julian Edelman, Danny Amendola (maybe), Nate Washington and Chris Hogan will be almost unstoppable. Donta’ Hightower and Jamie Collins (both 26) are just coming into their prime years and are the key cogs in a defense that should be strong despite the loss of Chandler Jones. Although game dates have not yet been released, there is no reason to believe the Pats won’t have another run at the ring in 2016.. Along with in-conference games against teams that did not make the play-offs last year (J-E-T-S, Dolphins & Bills) they play the clueless Browns, befuddled 49ers, sliding Ravens and homeless (???) Rams. That leaves Seattle, Houston, Pittsburgh, Arizona and Super Bowl Champion, but QB challenged, Denver as threats to a chance for ring #5 for Tom Brady, the oldest active non-kicker in the NFL. So, no matter what, the best Head Coach/QB combo in the NFL and the New England Patriots are once again positioning the team for a run at the Lombardi Trophy and fans are having fun analyzing every move they make. The focus on Julian Edelman’s return to the Patriots line-up has rightfully been the center of attention since the season ended with the New England offense looking more like the Cleveland Browns than the juggernaut that started the season. 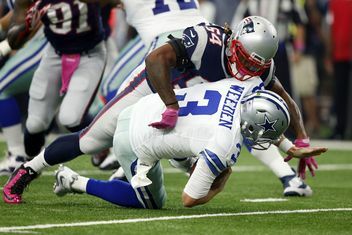 His week 10 broken foot against the Giants crippled not only the player, but the entire Patriots offense. There are many reasons why his return will help rejuvenate a stagnant Patriot offense. The weakest part of the New England offense, the offensive line, is exposed less with Edelman playing because Brady has that security blanket available for his quick release. No one else filled that role during his absence. Danny Amendola did his best, but it wasn’t quite good enough. Don’t underestimate the importance of #4. The bye-week does give time for the big guys up front to rest. However, at it’s best, this season it was mediocre…even when rested. The return of Sebastian Vollmer helps, but even when he was playing Brady was getting hit hard and often. The most consistent players have been perennial back-up Josh Kline (per Mike Reiss 77.4% of offensive snaps) and rookie David Andrews (68.5%), which shows just how bad things have been. The return of Edelman alone is not a cure-all. Although it should make a huge difference on offense, the defense needs to get back to the dominant group that intimidated QBs throughout the league. The return to health of some key defensive players should take a lot of pressure off the offense, allowing wins while falling short of scoring 30+ points a game. Remember three years ago when we were all questioning Hightower’s ability to diagnose offenses and actually make the big play? As we’ve seen over the past two seasons, he has dispelled any doubt…he was a great 1st round draft pick (25th overall) in 2012! Arguably the most valuable player on the defense, Hightower has played injured for a while now…and it has shown with his hesitancy on the field. Hopefully this bye-week gets him confident that he is OK and he’ll return the All-Pro that he was prior to getting banged up. When Hightower got injured Jones production suffered, despite the help he got from Jamie Collins and Jaball Sheard. At one point it felt like Jones was going to smash all Patriot sack records, but by seasons end he had an injured toe and was struggling to get to the QB. The two weeks off (he sat the last game) should re-energize his motor and the combination of Jones, Hightower, Sheard, Collins, Akiem Hicks, Malcom Brown and, old faithful, Rob Ninkovich will have opposing teams scratching their head when they have the ball. 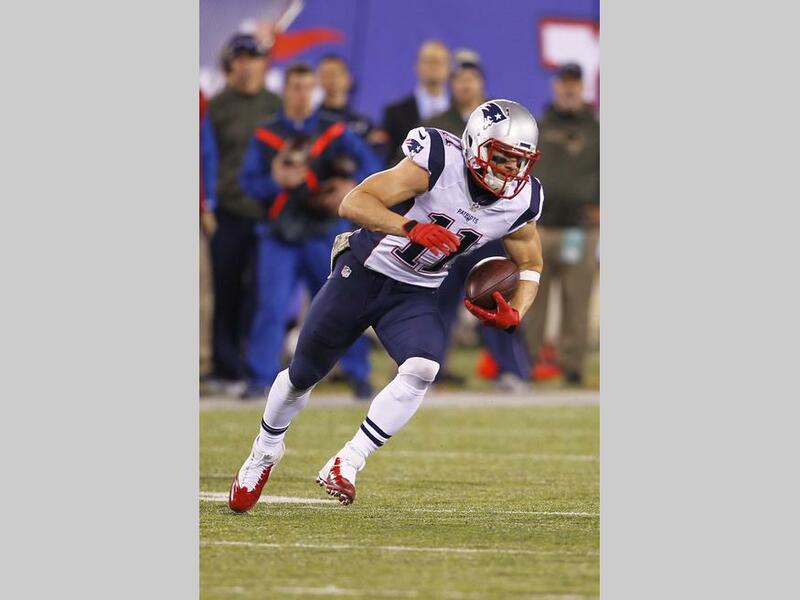 If Edelman hadn’t been out Amendola wouldn’t have played (injury) at the end. No one can ever question his toughness to me. Here’s hoping fans appreciate how much he has done this year, beside building a car port in an upper class area of Rhode Island. The trio of Gronkowski, Edelman, Amendola along with James White, Brandon LaFell (yes, as 4th receiver), Steven Jackson and Keshawn Martin should keep defenses on their heels, cutting back on the pressure being put on Brady. No, he’s not an afterthought. When he limped off the field in Miami, Patriot’s Nation held their collective breath and looked to the sky. Why, oh why, was he even playing? Despite the (high?) ankle sprain sustained on a low hit (no penalty?) by arguably the dirtiest player in the NFL (Ndamukong Suh) you know #12 will be on the field doing anything it takes to win. …And No More Injuries, Please! It seems every day something new pops up on the injury front. 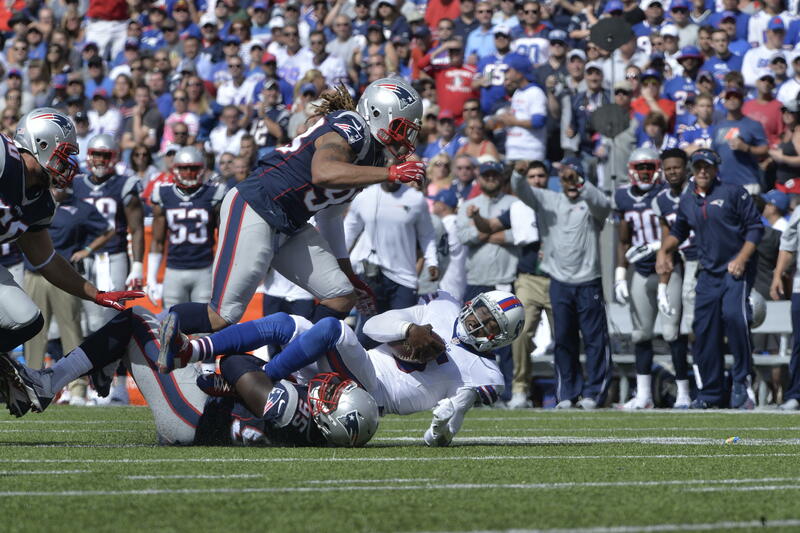 Whether it was Chandler Jones last week or Nate Ebner Thursday, enough is enough. There are more, but those six were key players. So, everyone else, please, stay healthy for the 1st real game of the season, January 16 at Foxborough…as the next step to ring #5 commences.